After having developed an updated version of the CH-47 "Chinook" in 1976, designated the CH-47D, which incorporated improvements to the dynamic components (e.g. rotor transmission) and avionics systems, Boeing Vertol completed a project in summer 1978 for a commercial version of the same aircraft, primarily intended for operators of oil platforms but also suitable for the prospecting of remote areas. The airframe of the Model 234 is based on that of the military Chinooks, but has many new features such as fiberglass blades of larger chord in place of metal ones, different-sized fairings along the sides of the fuselage containing fuel, a longer nose to house the weather radar and front landing gearwheels shifted farther forward. Two versions of the Model 234 are available: a long-range version with lateral fairings almost twice the size of the original Chinook ones, which have 6360kg fuel capacity, and a utility version in which the fuel tanks of 1826kg are contained in four smaller fairings level with each wheel. The helicopter can be converted from one version to the other. This takes about eight hours' work by two specialists. The three rotor blades are interchangeable and maintenance has been reduced to a minimum, with considerable savings in running costs. The service life of the engines has also been increased to 1800 hours TBO. The passenger compartment of the long-range version has 44 seats arranged in four rows with a central corridor and there is an ample baggage compartment at the rear of the fuselage; it has a crew of three. A typical mixed combination in the utility version consists of 11 passengers and 7250kg of freight. This version also has a cargo hook at the center of the fuselage capable of lifting up to 12700kg. The first order for the Boeing Vertol 234 came from British Airways Helicopters, to meet a requirement for six aircraft for offshore work in the North Sea. Since then Helicopter Service in Norway and ARCO in Alaska have also put the type in service for offshore support. Production by Boeing Vertol of new military Chinooks is now limited to orders for the Model 414, which is an international export version and the MH-47E, a Special Forces variant of the CH-47D with night/low flying avionics and an inflight-refuelling probe. However, in the late summer of 1978 the company announced the development of a civil counterpart of the military Chinook, intended for commercial service. Two basic versions were planned, the long-range Model 234LR to serve in all-passenger, passenger/freight 'combi', or all-cargo, civil roles; and the Model 234UT utility version for more specialised tasks such as resources exploration and development, logging, and general utility heavy construction work. The Model 234LR programme was launched in November 1978, following the finalisation of a contract with British Airways Helicopters (BAH) for the initial supply of three of these aircraft required primarily by BAH to carry passengers and priority cargo from points in Scotland to and from North Sea platforms operated by the Esso and Shell petroleum companies. To facilitate such operations, emphasis has been placed on the interior design so that it can be converted comparatively easily by the operator from all-passenger to 'combi' or all-cargo use. In full passenger configuration these Chinooks have the largest capacity of any commercial helicopter, with four-abreast seating for a maximum of 44 passengers. They enjoy a standard of interior design and comfort similar to that found in the Boeing Company's airliners, with roomy, comfortable seats; individual service units; complete lavatory facilities; overhead baggage compartments; ample windows, and pleasant lighting conditions; a food or beverage galley; and a stereo system. Access for passengers is via a door at the forward end of the cabin on the port side, and the undersurface of the upswept rear fuselage is formed by an hydraulically-operated cargo-landing ramp. In a typical 'combi' layout, 18 passengers can be accommodated in the forward area of the cabin, with 7258kg of freight at the rear. In an all-cargo configuration up to 9072kg can be carried internally, or a maximum of 12701kg externally, suspended from a cargo hook or hooks. 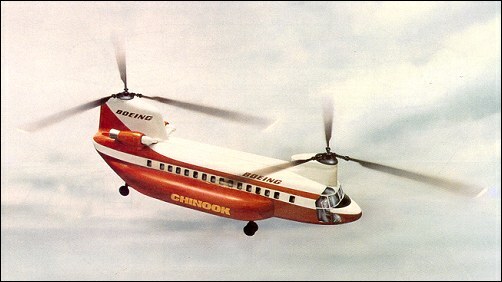 The rotors of the civil Chinook are powered by two Avro Lycoming AL 5512 turboshaft engines, via a combining gearbox and interconnecting shafts which enable both rotors to be driven in emergency by either engine. To provide the essential range, large external fuel tanks are accommodated within the fairings which extend along both sides of the lower fuselage. These fairings serve a dual purpose, for they also provide a flotation capability that can ensure survival of the aircraft if forced down onto a sea surface with storm waves not exceeding 9.15m in height. Overwater operation throughout the year demands a high standard of all-weather capability, and this is ensured by the provision of weather radar, duplicated full blind-flying instrumentation, and a dual four-axis automatic flight control system. Comprehensive de-icing provisions are embodied, though these are optional for service in less critical areas, and the glassfibre rotor blades incorporate an aluminium screen in their construction, to provide adequate protection against lightning strikes. Safety equipment includes two life-rafts, each of which is capable of accommodating up to 36 persons. The first Model 234LR made its maiden flight on 19 August 1980, and two additional aircraft took part in the development programme. FAA and CAA certification were gained on 19 and 26 June 1981 respectively, and the first example entered service with BAH on 1 July 1981. Launched by British Airways Helicopters order for three in 1978 (later increased to six) for North Sea offshore operations; first flight 19 August 1980; FAA and CAA certification 19 and 26 June 1981 respectively; first service with BAH (now British International Helicopters) 1 July 1981; FAA and CAA certificated 234 LR Combi Summer 1982. 234 LR Long Range: About twice CH-47 fuel load in composites tanks attached to fuselage flanks with anti-vibration mounts; flight deck floor on shockmounts; 44-passenger interior (on shockmounts), with toilet and galley, based on Boeing airliners; walk-on baggage bins on rear ramp; alternative mixed passenger/cargo or all-cargo layouts. 234 ER Extended Range: Typical configurations are 17 passengers and two tanks for additional 1,621km or 32 passengers and single cabin fuel tank; FAA certificated May 1983. 234 UT Utility: External fuel cells replaced by two cylindrical tanks in forward fuselage: FAA supplemental-type certificate October 1981 at maximum gross weight 23,133kg with external loads up to 12,700kg on single hook; approved for 24 passengers and operation at up to 3,660m at full gross weight. No known orders, but several converted to this configuration. 234 MLR Multipurpose Long Range: Similar to 234 LR but with utility interior; can be reconfigured in 8 hours; four men can handle cabin cylindrical fuel tanks and ramp baggage bins. 234-100: Commercial equivalent of CH-47D Chinook, proposed to be built in China under co-production agreement between Boeing and Harbin Aircraft Manufacturing Company (HAMC). Minimum launch commitment set at 10 units, with at least 50 required over a five-year period to make it economically viable. 234 Combi: Firefighting modification by Columbia Helicopters equipped to carry 19 firefighters and equipment, capable of dropping 11,370 litres of water. Also carries 9,854 litre Bambi bucket. LANDING GEAR: As described for CH-47D, but with tyre pressures of 8.55 bars on forward gear, 7.20 bars on rear gear. Wheel-ski gear optional. POWER PLANT: Two Textron Lycoming AL 5512 turboshafts, pod-mounted on sides of rear rotor pylon. Each engine has maximum T-O rating of 3,039kW, maximum continuous rating of 2,218.5kW, and 30 minutes contingency rating of 3,247kW. Long-range model has two fuel tanks, one in each fuselage side fairing, with total capacity of 7,949 litres. Utility model has two drum-shape internal tanks, with total capacity of 3,702 litres. Extended-range model has both fuselage side and internal drum tanks. Single-point pressure refuelling. ACCOMMODATION: Two pilots side by side on flight deck, with dual controls. Passenger cabin of long-range model seats up to 44 persons four-abreast, with centre aisle. Each seat has overhead bin and underseat stowage for carry-on baggage; larger items are stowed over the rear ramp in the main baggage compartment. Galley, with cabin attendant's seat, and toilet, are standard, between flight deck and cabin. Basic FAA/CAA approved combi versions offer 8 to 32 passenger seats, with cargo at rear of cabin, loaded via rear ramp; or 22 to 32 passenger seats, with cargo stowed on only one side of cabin's centre aisle. All passenger facilities can be removed, and heavy-duty floor installed, for freight-only service. Passenger door at front of cabin on starboard side. Crew door on each side of flight deck. Cabin floor supported by dynamically tuned fittings to reduce vibration. Hydraulically powered cargo ramp can be stopped at any intermediate position to match the level of the loading vehicle being used. SYSTEMS: Heating and ventilation systems maintain comfortable flight deck/cabin temperature in ambient temperatures down to -32�C. Duplicated flying control, hydraulic and electrical systems, as described for CH-47D/Model 414. Solar T62T-2B APU, rated at 71kW, drive auxiliary gearbox on rear transmission to start engines and provide power for two flying control system hydraulic pumps and two alternators. All critical systems heated to inhibit ice build-up. AVIONICS: Duplicated full blind-flying instru-mentation, weather radar, and dual four-axis automatic flight control system with built-in test equipment, provide all-weather capability. EQUIPMENT: Optional equipment includes passenger interior furnishings for the utility model, combi interior, downward-shining cargo load light, rescue hoist of 272kg capacity, glass fibre wheel-skis, an ice detector probe, and ditching equipment that includes two liferafts, each with an overload capacity of 36 persons. Standard items include integral work platforms, and a maintenance panel that allows 26 separate checks to be made from a single ground level position. Single central cargo hook is standard on utility model for carrying external loads of up to 12,700kg. Optional dual tandem hooks for precision operations and for load stability in high-speed flight; or three tandem hooks for delivering multiple loads. The Boeing Vertol 234LR Commercial Chinook is the civil derivative of the highly successful Models 114 and 234, used by the US Army as the CH-47 Chinook medium-transport military helicopter series. The Model 114, military designation CH-47A, was itself a development of the Boeing Vertol 107 tandem-rotor helicopter, this latter also being the developed form of a concept pioneered by the Piasecki Helicopter Corporation. The civil 234LR was announced in the summer of 1978 as a contender in the market for offshore oilfield support helicopters, with the ability to undertake other commercial operations. Although modelled closely on the CH-47C variant of the basic design, the 234LR is designed to carry up to 44 passengers over ranges of approximately 925km. To meet this requirement the 234LR is fitted with cabin windows similar to those of the Boeing 727 airliner, airliner seats at 84cm pitch, overhead baggage lockers, and a number of other 'airliner' features. Other alterations compared with the military 234 are the inclusion of civil versions of the engines (in the form of Avco Lycoming AL 5512 turboshafts, each with a take-off rating of about 4075shp, and a new fuel system with pressure-refuelling capability, and glassfibre rotor blades. Although the 234LR will undoubtedly offer operators considerable advantages (for example one 234LR could replace three of the Sikorsky S-61Ns currently used for most offshore support operations), there are problems: the cost of the 234LR is likely to rise by some 40% before the type enters service in 1982, and the related engine used in the Bell 214B BigLifter (the Lycoming T5508D) has run into severe difficulties. The two engines are located in pods on each side of the rear rotor pylon, the rotors being driven in counter-rotating directions by a series of interconnected shafts which ensure that each engine drives both rotors in the event of the other failing. In the military model the transmission is rated at 7200shp for twin-engined operation, and at 4600shp for single-engined flight, but this will presumably be further strengthened on the 234LR, which has more power and greater take-off weight (23133kg with an external load compared with 20865kg). The keynote of the 234LR's projected success is its great versatility: apart from a payload of up to 44 passengers, the helicopter can carry an internal load of some 9526kg in the cabin, which is 9.19m long, 2.51m wide, and 1.98m high. Alternatively, a maximum payload of 13290kg can be carried externally with the helicopter in its utility configuration. With an internal payload the 234LR's maximum take-off weight is 21318kg, compared with 23133kg with an external payload. Fuel load can also be altered considerably: in the utility version, maximum capacity is 1826kg; in the long-range layout, this capacity is increased to 6361kg. Please be kind enough to send much information on Commercial Chinook 234LR Long Rang to: Mr Jan Arriola to 3345 Mentone Avenue, Los Angeles California 90034. Does anyone know if anybody still operates a civil chinook in the uk.My wife has a life long ambition the fly in one. Pls I need a Vertol 234 for Oil transport from Refinery to Township oil depot across bad land terrain. This means I need an air vessel with large capacity - up to 33,000Ltrs. Now, can the 234 Utility capacity be expanded to accomodate that much as there will be no need to haul an external load? Pls I need a response on this preferably in my e-mail. from where i can buy civil one which take about 50 passangers ? Please inform about the Boeing-Vetrol234 operations in high mountain areas. What's the selling/market price value of new Vetrol? (i)infra-structural facilities required on our side to start air service for vertols. (j)list of vertol owners who would be interested in joint venture,THANKS. What was the selling price of the 234 when first delivered? � In all-passenger versions of the 234, a galley and toilet are fitted. A passenger attendant can also be carried. � The first Commercial Chinook made its maiden flight on 19 August 1980. � British Airways Helicopters accepted the first of its six 234s in December 1980. � Columbia Helicopters reported the 234 'an excellent success' in logging operations in mountainous areas. � Model 234s carry external cargoes slung from as many as four separate hooks. � Boeing engineers claim that the Chinook fuselage will hold 180,000 golf balls.